Dana Fonteneau draws on her diverse background in music, business, finance, and psychology to help her clients attain greater personal and career success. She is part performance coach, management consultant, financial advisor, and therapist. Equally comfortable in the board room and the concert hall, Dana helps individuals and small businesses succeed. Her international practice is centered in the arts where she works with top soloists, chamber ensembles, orchestral musicians, actors, dancers, and educators, as well as with leading administrators, board members, and managers throughout the music industry. Dana also continues to work with select entrepreneurs, business owners, boards, and companies outside of classical music. Dana’s writing can be found on her blog 'The WholeHearted Musician'; in feature articles for Strings Magazine and Chamber Music Magazine; and her book "It's Not (JUST) About the Gig" which examines what success means to musicians and how to achieve it. Over the past two decades, Dana has developed a strong track record of helping both those with established careers and rising talents clarify their goals and achieve sustainable results. Her consulting work is conducted one-on-one and in small group settings. Her targeted work has enabled clients to negotiate successful consulting contracts; succeed at interviews and auditions; and significantly increase business, profit, and fundraising results. Dana has appeared as a guest speaker at nearly every major music school in the United States including the Juilliard School, Manhattan School of Music, University of Michigan, Rice University, University of Texas at Austin, and the San Francisco Conservatory. She has presented and served as a career advisor at the Chamber Music America National Conference, Yellow Barn Chamber Music Festival, and runs her own week-long retreat for professional string quartets at the Avaloch Farm Music Institute. 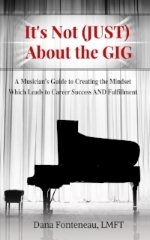 Dana’s writings can be found on her blog The WholeHearted Musican; in feature articles for Strings Magazine and Chamber Music Magazine; and her book "It's Not (JUST) About the Gig" which examines what success means to musicians and how to achieve it.